Ds. Hervey. C. P. S.
The Answer of William Urquhart of Meldrum Esquire and others, to the Appeal of Kenneth McKenzie, was brought in. Bishop of Landaff takes the Oaths. 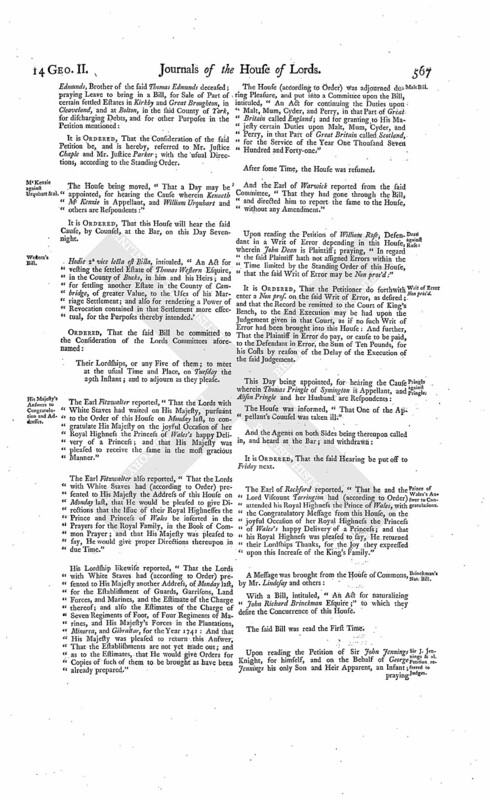 John Lord Bishop of Landaff, at the Table, took the Oaths, and made and subscribed the Declaration, and also took and subscribed the Oath of Abjuration, pursuant to the Statutes. Ordered, That the Lords with White Staves do, from this House; wait on His Majesty, to congratulate His Majesty on the joyful Occasion of her Royal Highness the Princess of Wales's happy Delivery of a Princess. Ordered, That a Message be sent from this House, to congratulate their Royal Highnesses the Prince and Princess of Wales, on the same joyful Occasion; and that the Earl of Rochford and Lord Viscount Torrington do carry the said Message. 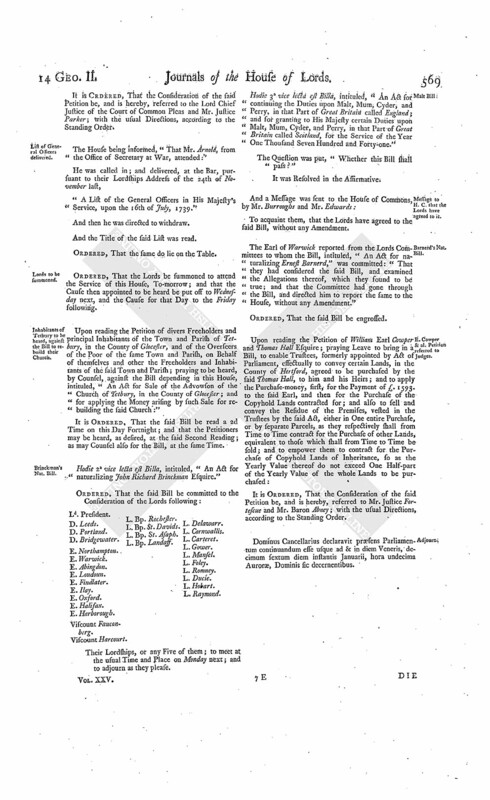 With a Bill, intituled, "An Act for continuing the Duties upon Malt, Mum, Cyder, and Perry, in that Part of Great Britain called England; and for granting to His Majesty certain Duties upon Malt, Mum, Cyder, and Perry, in that Part of Great Britain called Scotland, for the Service of the Year One Thousand Seven Hundred and Forty-one;" to which they desire the Concurrence of this House. Hodie 3a vice lecta est Billa, intituled, "An Act for naturalizing Eve Superiori alias Smith." Address for the Issue of the Prince of Wales to be prayed for. Ordered, That an humble Address be presented to His Majesty, "That He will be graciously pleased to give Directions, that the Issue of their Royal Highnesses the Prince and Princess of Wales be inserted in the Prayers for the Royal Family, in the Book of Common Prayer." Ordered, That the said Address be presented to His Majesty, by the Lords with White Staves. Hodie 1a vice lecta est Billa, intituled, "An Act for vesting the Seat and Estates of Nicholas late Earl of Scarsdale, deceased, in the several Counties of Derby and Nottingham, comprized in his Settlement and Will, and the Furniture there at his Death, in Trustees, to be sold, for speedier Payment of his Debts; and preserving the Surplus to go according to his said Settlement and Will." The House being moved, "That a Day may be appointed, for hearing Counsel, to argue the Errors assigned upon a Writ of Error depending in this House, wherein John Parkhurst Esquire and others are Plaintiffs, and Joseph Smith, upon several Demises of John Dormer Esquire, is Defendant:"
It is Ordered, That this House will hear the said Errors argued, by Counsel, at the Bar, on Monday the 9th Day of February next. Admirals Vernon's and Haddock's Papers, from the Admiralty-office, delivered. 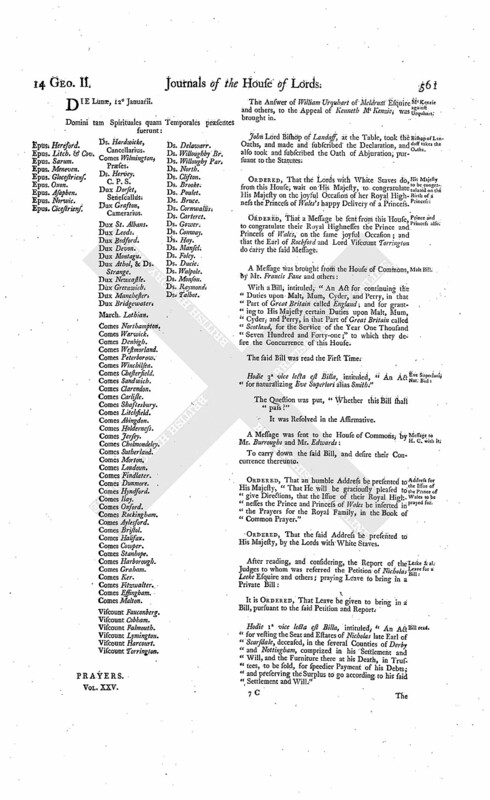 The House being informed, "That Mr. Haws, from the Admiralty-office, attended:"
"Copies of several Instructions and Orders from the Commissioners of the Admiralty; with Schedules of the said Copies." "No 1. Extract of a Letter from Vice Admiral Vernon, to Mr. Burchett, dated 23d July, 1739." "2. Extract of a Letter from Vice Admiral Vernon, to Mr. Burchett, dated 27th August, 1739." "3. Extract of a Letter from Vice Admiral Vernon, to Mr. Burchett, dated 1st October, 1739." "4. Extracts of a Letter from Vice Admiral Vernon, to Mr. Burchett, dated 31st October, 1739." "5. Extract of a Letter from Vice Admiral Vernon, to Mr. Burchett, dated at Jamaica, 2d February, 1739." "6. Extract of a Letter from Vice Admiral Vernon, to Mr. Burchett, dated from the 26th to the 31st May, 1740." "7. Extract of a Letter from Mr. Burchett, to Vice Admiral Vernon, dated 10th March, 1739." "8. Copy of a Letter from Mr. Burchett, to Vice Admiral Vernon, dated 27th March, 1740." "9. Copy of a Letter from Mr. Burchett, to Vice Admiral Vernon, dated 12th May, 1740." "10. Copy of a Letter from Mr. Burchett, to Vice Admiral Vernon, dated 20th June, 1740." "No 1. Extract of Instructions from the Commissioners of the Admiralty, to Rear Admiral Haddock, dated 13th May, 1738." "2. Extract of an Order from the Commissioners of the Admiralty, to Rear Admiral Haddock, dated 11th July, 1738." "3. Extract of an Order from the Commissioners of the Admiralty, to Rear Admiral Haddock, dated 18th July, 1738." "4. Copy of an Order from the Commissioners of the Admiralty, to Rear Admiral Haddock, dated 25th October, 1738." "5. Copy of an Order from the Commissioners of the Admiralty, to Rear Admiral Haddock, dated 25th January, 1738." "6. Extract of an Order from the Commissioners of the Admiralty, to Rear Admiral Haddock, dated 29th January, 1738." "7. Copy of an Order from the Commissioners of the Admiralty, to Rear Admiral Haddock, dated 10th March, 1738." "8. Copy of an Order from the Commissioners of the Admiralty, to Rear Admiral Haddock, dated 9th April, 1739." "9. Copy of an Order from the Commissioners of the Admiralty, to Rear Admiral Haddock, dated 6th June, 1739." "10. Copy of an Order from the Commissioners of the Admiralty, to Rear Admiral Haddock, dated 21st June, 1739." "11. Copy of an Order from the Commissioners of the Admiralty, to Rear Admiral Haddock, dated 8th November, 1739." "12. Copy of an Order from the Commissioners of the Admiralty, to Rear Admiral Haddock, dated 14th March, 1739." "13. Copy of an Order from the Commissioners of the Admiralty, to Rear Admiral Haddock, dated 24th March, 1739." "14. Copy of an Order from the Commissioners of the Admiralty, to Rear Admiral Haddock, dated 29th March, 1740." "15. Copy of an Order from the Commissioners of the Admiralty, to Rear Admiral Haddock, dated 2d June, 1740." "16. Copy of an Order from the Commissioners of the Admiralty, to Rear Admiral Haddock, dated 5th June, 1740." Ordered, That the said Papers do lie upon the Table. Scawen & al. Petition referred to Judges. It is Ordered, That the Consideration of the said Petition be, and is hereby, referred to Mr. Justice Fortescue and Mr. Justice Parker; with the usual Directions, according to the Standing Order. Viscount Garnock, Petition referred to Judges. It is Ordered, That the Consideration of the said Petition be, and is hereby, referred to the Lord Chief Justice of the Court of Common Pleas and Mr. Justice Parker; with the usual Directions, according to the Standing Order. Huddleston & al. Petition referred to Judges. It is Ordered, That the Consideration of the said Petition be, and is hereby, referred to Mr. Baron Reynolds and Mr. Baron Abney; with the usual Directions, according to the Standing Order. Creswell, Leave for a Bill. Address for Establishment of Guards, &c.
Ordered, That an humble Address be presented to His Majesty, "That He will be graciously pleased to order the proper Officer to lay before this House, the Establishment of Guards, Garrisons, and Land Forces, for the Year 1741; the Establishment of the Marines, for the Year 1741; the Estimate of the Charge of the Guards, Garrisons, and other His Majesty's Land Forces, in Great Britain, including the Land Forces and Marines in Lord Cathcart's Expedition, for the Year 1741; Estimate of the Charge of Seven Regiments of Foot, amounting to 5705 Men, proposed to be raised for the Service of the Year 1741; Estimate of the Charge of Four Regiments of Marines, amounting to 4620 Men, proposed to be raised for the Service of the Year 1741; and the Estimate of the Charge of His Majesty's Forces, in the Plantations, Minorca, and Gibraltar, for the Year 1741." Ordered, That the said Address be presented to His Majesty by the Lords with White Staves. Letters to and from Admiral Vernon delivered. "Copies and Extracts of several Letters; with Lists thereof." "Extract of a Letter from the Duke of Newcastle, to Vice Admiral Vernon, August 13th, 1739." "Extract of a Letter from Vice Admiral Vernon, to the Duke of Newcastle; Burford, at Sea, August 15th, 1739; received September 10th." "Extract of a Letter from the Duke of Newcastle, to Vice Admiral Vernon, September 28th, 1739." "Extract of a Letter from Vice Admiral Vernon, to the Duke of Newcastle; Jamaica, January 18th, 31st, and February 2d, 1739/40; received March 25th." "Extract of a Letter from the Duke of Newcastle, to Vice Admiral Vernon, March 26th, 1740." "Extract of a Letter from the Duke of Newcastle, to Vice Admiral Vernon, April 18th, 1740." "Extract of a Letter from Vice Admiral Vernon, to the Duke of Newcastle; Strafford, at Sea, February 25th, 1739/40; received May 24th." "Extract of a Letter from Mr. Stone, to Vice Admiral Vernon, May 30th, 1740." "Extract of a Letter from the Duke of Newcastle, to Vice Admiral Vernon, July 4th, 1740." "Extract of a Letter from Vice Admiral Vernon, to the Duke of Newcastle; Burford, in Port Royal Harbour, May 9th, 1740; received July 19th." "A List of Vice Admiral Vernon's Squadron, when joined by the Ships that convoy the Expedition." "Extract of a Letter from Vice Admiral Vernon, to the Duke of Newcastle; Burford, in Port Royal Harbour, May 26th and 31st, 1740; received August 5th." "Extract of a Letter from the Duke of Newcastle, to Vice Admiral Vernon, September 12th, 1740." "Extract of a Letter from Vice Admiral Vernon, to the Duke of Newcastle; Port Royal, July 19th, 1740; received October 7th." "Extract of a Letter from Mr. Stone, to Vice Admiral Vernon, October 7th, 1740." "An Account of Naval Stores sent to Jamaica, since Admiral Vernon sailed; and of those now going thither, October 10th, 1740." "Extract of a Letter from Vice Admiral Vernon, to the Duke of Newcastle; Jamaica, August 30th, 1740; received November 15th." "Copy of a Letter from the Duke of Newcastle, to Rear Admiral Haddock, June 20th, 1739." "Extract of a Letter from the Duke of Newcastle, to Rear Admiral Haddock, August 8th, 1739." "Extract of a Letter from the Duke of Newcastle, to Rear Admiral Haddock, September 5th, 1739." "Extract of a Letter from the Duke of Newcastle, to Rear Admiral Haddock, November 7th, 1739." "Extract of a Letter from the Duke of Newcastle, to Sir Chaloner Ogle, March 25th, 1740." "Extract of a Letter from the Duke of Newcastle, to Rear Admiral Haddock, April 4th, 1740." "Extract of a Letter from the Duke of Newcastle, to Rear Admiral Haddock, April 18th, 1740." "Copy of a Letter from the Duke of Newcastle, to Sir Chaloner Ogle, May 24th, 1740." "Copy of a Letter from Mr. Stone, to Sir Chaloner Ogle, May 27th, 1740." Ordered, That the said Papers do lie on the Table. Upon reading the Petition and Appeal of Mary Logan and James McHarg her Husband; complaining of an Interlocutor, of the Lords of Session in Scotland, of the 28th of June 1739; and also of another Interlocutor, of the 29th of November 1740, and of their Adherence thereto, of the 11th of December last; and praying, "That the said Interlocutors may be reversed; and that the Appellant may have such Relief as to the House in their great Wisdom and Justice shall seem reasonable:"
It is Ordered, That John Logan may have a Copy of the said Appeal; and he is hereby required to put in his Answer thereunto, in Writing, on or before Monday the 9th Day of February next; and that Service of this Order upon the said Respondent, or his Lawyers and Agents before the Court of Session be deemed good Service. Sir William Barker against Jevers. It is Ordered, That the further Hearing of this Cause be adjourned till To-morrow. Dominus Cancellarius declaravit præsens Parliamentum continuandum esse usque ad et in diem Martis, decimum tertium diem instantis Januarii, hora undecima Auroræ, Dominis sic decernentibus. The Answer of Patrick Crichton Sadler in Edinburgh, to the Petition and Appeal of Alexander Pitcairn of Woodhouslie Gentleman, and His Majesty's Advocate for Scotland, was brought in. Hodie 3a vice lecta est Billa, intituled, "An Act for continuing the Duties upon Malt, Mum, Cyder, and Perry, in that Part of Great Britain called England; and for granting to His Majesty certain Duties upon Malt, Mum, Cyder, and Perry, in that Part of Great Britain called Scotland, for the Service of the Year One Thousand Seven Hundred and Fortyone." Ordered, That the said Bill be committed to a Committee of the whole House, To-morrow. Upon reading the Petition and Appeal of Mr. Archibald Denham, alias Stewart, Advocate; complaining of several Interlocutors of the Lords of Session in Scotland, of the 15th of December 1737, the 12th of July 1738, the 16th of January 1739/40, and 23d of December last, made on Behalf of Alexander Baillie; and praying, "That the same may be reversed; and that the Appellant may have such Relief as to the House in their great Wisdom shall seem meet:"
It is Ordered, That the said Alexander Baillie may have a Copy of the said Appeal; and he is hereby required to put in his Answer thereunto, in Writing, on or before Tuesday the 10th Day of February next; and that Service of this Order on his Procurators, Agents, or Solicitors in the Cause, in the Court of Session, be deemed good Service. Tutt, Leave for a Bill. Hodie 2a vice lecta est Billa, intituled, "An Act for Sale of the Advowson of the Church of Tetbury, in the County of Glocester; and for applying the Money arising by such Sale for re-building the said Church." Hodie 1a vice lecta est Billa, intituled, "An Act for vesting the settled Estate of Thomas Western Esquire, in the County of Bucks, in him and his Heirs; and for settling another Estate, in Cambridgeshire, of greater Value, to the Uses of his Marriage Settlement." Ordered, That Leave be given to bring in a Bill, as desired. Accordingly, the Earl of Warwick presented a Bill, intituled, "An Act for naturalizing Ernest Barnerd." Hodie 2a vice lecta est Billa, intituled, "An Act for vesting the Seat and Estates of Nicholas late Earl of Scarsdale, deceased, in the several Counties of Derby and Nottingham, comprized in his Settlement and Will, and the Furniture there at his Death, in Trustees, to be sold, for speedier Payment of his Debts; and preserving the Surplus to go according to the said Settlement and Will." Viscount Falmouth. L. Bp. Rochester. L. Bp. Landaff. Ld. Delawarr. Their Lordships, or any Five of them; to meet at the usual Time and Place, on Wednesday the 28th Instant; and to adjourn as they please. 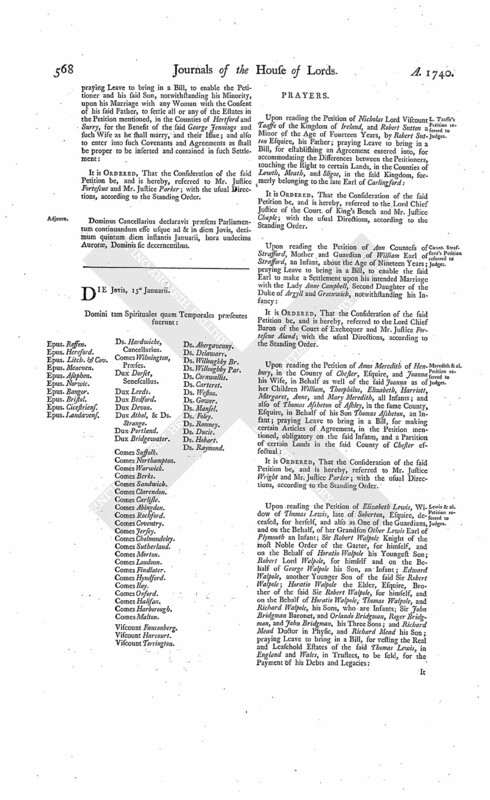 It is Ordered and Adjudged, by the Lords Spiritual and Temporal in Parliament assembled, That the said Petition and Appeal be, and is hereby, dismissed this House; and that the said Orders therein complained of be, and the same are hereby, affirmed: And it is further Ordered, That the Appellant do pay the Sum of One Hundred Pounds, of lawful Money of Great Britain, for Costs in respect of the said Appeal; but that, instead of the same being Personally paid by the Appellant to the Respondent, the said Court of Chancery do give proper Directions, that the said Sum of One Hundred Pounds be allowed and deducted out of the Costs, which were ordered, by the Judgement of this House of the 18th of December 1724, to be paid by the Respondent to the Appellant, and are still remaining due under the same. The House being moved, "That a Day may be appointed, for hearing the Cause wherein Alexander Pitcairn is Appellant, and Patrick Crichton Respondent:"
It is Ordered, That this House will hear the said Cause, by Counsel, at the Bar, on Monday the 2d Day of February next. Dominus Cancellarius declaravit præsens Parliamentum continuandum esse usque ad & in diem Mercurii, decimum quartum diem instantis Januarii, hora undecima Auroræ, Dominis sic decernentibus. Viscount Torrington. Ds. Willoughby Br. McKattie against Frigg and Fraser. The Answer of John Frigg Merchant in Findhorn, and James Fraser Merchant in Inverness in Company, to the Appeal of Peter McKattie Factor or Agent in London, was brought in. Ernest Barnerd took the Oaths appointed, in order to his Naturalization. Hodie 2a vice lecta est Billa, intituled, "An Act for naturalizing Ernest Barnerd." Viscount Harcourt. L. Bp. Rochester. L. Bp. Landaff. Ld. Willoughby. Par. Pemberton & al. Petition referred to Judges. It is Ordered, That the Consideration of the said Petition be, and is hereby, referred to Mr. Justice Wright and Mr. Justice Parker; with the usual Directions, according to the Standing Order. Edmunds's Petition referred to Judges. It is Ordered, That the Consideration of the said Petition be, and is hereby, referred to Mr. Justice Chaple and Mr. Justice Parker; with the usual Directions, according to the Standing Order. McKenzie against Urquhart & al. The House being moved, "That a Day may be appointed, for hearing the Cause wherein Kenneth Mc Kenzie is Appellant, and William Urquhart and others are Respondents:"
It is Ordered, That this House will hear the said Cause, by Counsel, at the Bar, on this Day Sevennight. Their Lordships, or any Five of them; to meet at the usual Time and Place, on Tuesday the 29th Instant; and to adjourn as they please. His Majesty's Answers to Congratulation and Addresses. The Earl Fitzwalter reported, "That the Lords with White Staves had waited on His Majesty, pursuant to the Order of this House on Monday last, to congratulate His Majesty on the joyful Occasion of her Royal Highness the Princess of Wales's happy Delivery of a Princess; and that His Majesty was pleased to receive the same in the most gracious Manner." The Earl Fitzwalter also reported, "That the Lords with White Staves had (according to Order) presented to His Majesty the Address of this House on Monday last, that He would be pleased to give Directions that the Issue of their Royal Highnesses the Prince and Princess of Wales be inserted in the Prayers for the Royal Family, in the Book of Common Prayer; and that His Majesty was pleased to say, He would give proper Directions thereupon in due Time." 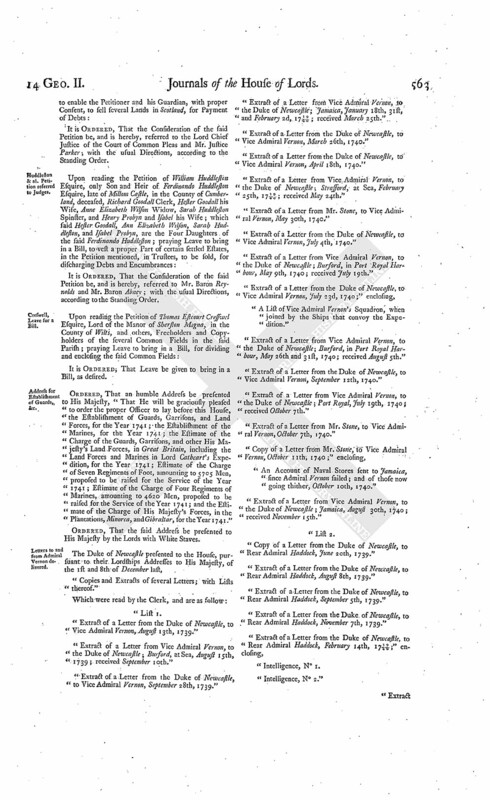 His Lordship likewise reported, "That the Lords with White Staves had (according to Order) presented to His Majesty another Address, of Monday last, for the Establishment of Guards, Garrisons, Land Forces, and Marines, and the Estimate of the Charge thereof; and also the Estimates of the Charge of Seven Regiments of Foot, of Four Regiments of Marines, and His Majesty's Forces in the Plantations, Minorca, and Gibraltar, for the Year 1741: And that His Majesty was pleased to return this Answer, That the Establishments are not yet made out; and as to the Estimates, that He would give Orders for Copies of such of them to be brought as have been already prepared." 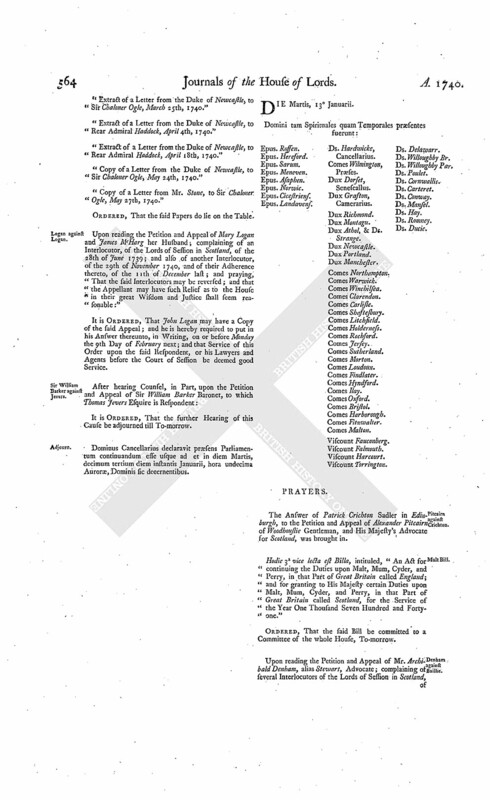 The House (according to Order) was adjourned during Pleasure, and put into a Committee upon the Bill, intituled, "An Act for continuing the Duties upon Malt, Mum, Cyder, and Perry, in that Part of Great Britain called England; and for granting to His Majesty certain Duties upon Malt, Mum, Cyder, and Perry, in that Part of Great Britain called Scotland, for the Service of the Year One Thousand Seven Hundred and Forty-one." Upon reading the Petition of William Rose, Defendant in a Writ of Error depending in this House, wherein John Dean is Plaintiff; praying, "In regard the said Plaintiff hath not assigned Errors within the Time limited by the Standing Order of this House, that the said Writ of Error may be Non pros'd:"
Writ of Error Non pros'd. It is Ordered, That the Petitioner do forthwith enter a Non pros. on the said Writ of Error, as desired; and that the Record be remitted to the Court of King's Bench, to the End Execution may be had upon the Judgement given in that Court, as if no such Writ of Error had been brought into this House: And further, That the Plaintiff in Error do pay, or cause to be paid, to the Defendant in Error, the Sum of Ten Pounds, for his Costs by reason of the Delay of the Execution of the said Judgement. The House was informed, "That One of the Appellant's Counsel was taken ill."
It is Ordered, That the said Hearing be put off to Friday next. Prince of Wales's Answer to Congratulations. The Earl of Rochford reported, "That he and the Lord Viscount Torrington had (according to Order) attended his Royal Highness the Prince of Wales, with the Congratulatory Message from this House, on the joyful Occasion of her Royal Highness the Princess of Wales's happy Delivery of a Princess; and that his Royal Highness was pleased to say, He returned their Lordships Thanks, for the Joy they expressed upon this Increase of the King's Family." With a Bill, intituled, "An Act for naturalizing John Richard Brinckman Esquire;" to which they desire the Concurrence of this House. Sir J. Jennings & al. Petition referred to Judges. Dominus Cancellarius declaravit præsens Parliamentum continuandum esse usque ad & in diem Jovis, decimum quintum diem instantis Januarii, hora undecima Auroræ, Dominis sic decernentibus. L. Taaffe's Petition referred to Judges. It is Ordered, That the Consideration of the said Petition be, and is hereby, referred to the Lord Chief Justice of the Court of King's Bench and Mr. Justice Chaple; with the usual Directions, according to the Standing Order. Count Strafford's Petition referred to Judges. It is Ordered, That the Consideration of the said Petition be, and is hereby, referred to the Lord Chief Baron of the Court of Exchequer and Mr. Justice Fortescue Aland; with the usual Directions, according to the Standing Order. Meredith & al. Petition referred to Judges. Lewis & al. Petition referred to Judges. List of General Officers delivered. 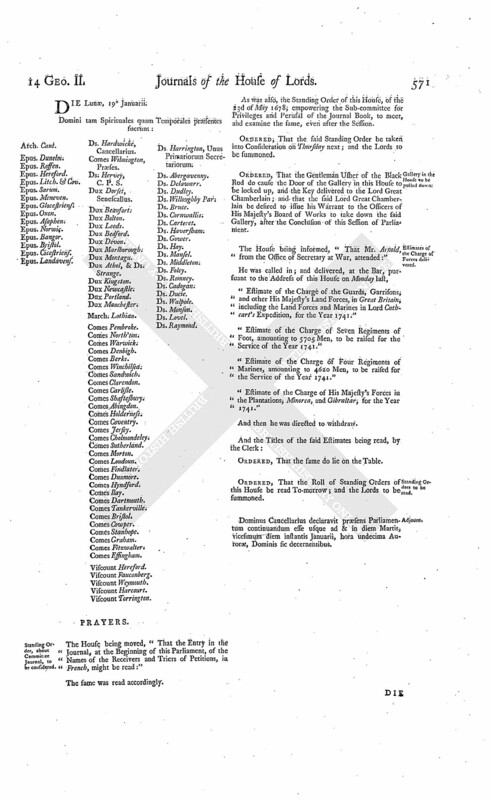 The House being informed, "That Mr. Arnold, from the Office of Secretary at War, attended:"
"A List of the General Officers in His Majesty's Service, upon the 16th of July, 1739." And the Title of the said Lift was read. Ordered, That the Lords be summoned to attend the Service of this House, To-morrow; and that the Cause then appointed to be heard be put off to Wednesday next, and the Cause for that Day to the Friday following. 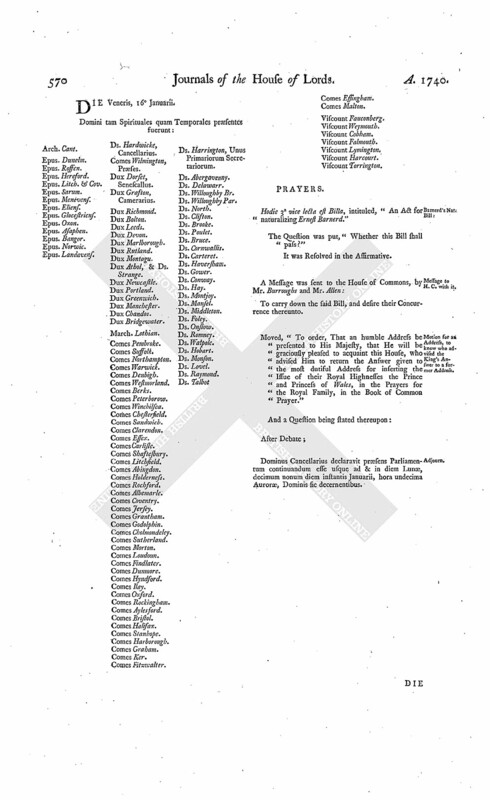 Inhabitants of Tetbury to be heard, against the Bill to rebuild their Church. 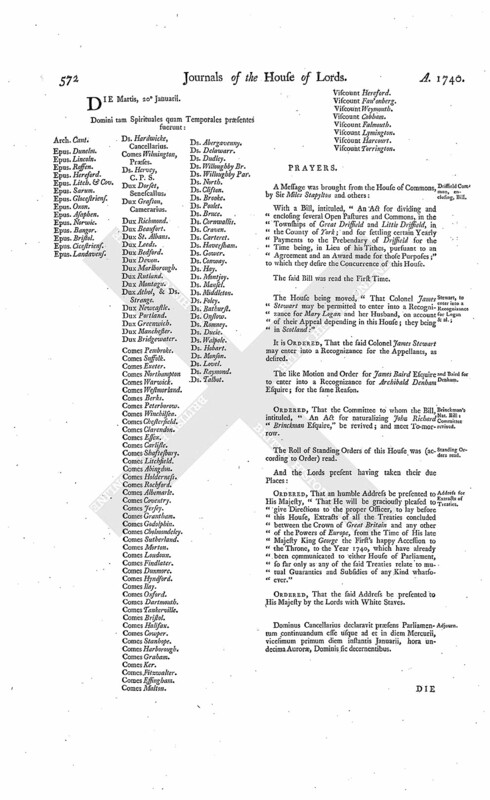 Upon reading the Petition of divers Freeholders and principal Inhabitants of the Town and Parish of Tetbury, in the County of Glocester, and of the Overseers of the Poor of the same Town and Parish, on Behalf of themselves and other the Freeholders and Inhabitants of the said Town and Parish; praying to be heard, by Counsel, against the Bill depending in this House, intituled, "An Act for Sale of the Advowson of the Church of Tetbury, in the County of Glocester; and for applying the Money arising by such Sale for rebuilding the said Church:"
It is Ordered, That the said Bill be read a 2d Time on this Day Fortnight; and that the Petitioners may be heard, as desired, at the said Second Reading; as may Counsel also for the Bill, at the same Time. Hodie 2a vice lecta est Billa, intituled, "An Act for naturalizing John Richard Brinckman Esquire." L. Bp. Landaff. L. Delawarr. Their Lordships, or any Five of them; to meet at the usual Time and Place on Monday next; and to adjourn as they please. Hodie 3a vice lecta est Billa, intituled, "An Act for continuing the Duties upon Malt, Mum, Cyder, and Perry, in that Part of Great Britain called England; and for granting to His Majesty certain Duties upon Malt, Mum, Cyder, and Perry, in that Part of Great Britain called Scotland, for the Service of the Year One Thousand Seven Hundred and Forty-one." The Earl of Warwick reported from the Lords Committees to whom the Bill, intituled, "An Act for naturalizing Ernest Barnerd," was committed: "That they had considered the said Bill, and examined the Allegations thereof, which they found to be true; and that the Committee had gone through the Bill, and directed him to report the same to the House, without any Amendment." E. Cowper & al. Petition referred to Judges. It is Ordered, That the Consideration of the said Petition be, and is hereby, referred to Mr. Justice Fortescue and Mr. Baron Abney; with the usual Directions, according to the Standing Order. Dominus Cancellarius declaravit præsens Parliamentum continuandum esse usque ad & in diem Veneris, decimum sextum diem instantis Januarii, hora undecima Auroræ, Dominis sic decernentibus. Hodie 3a vice lecta est Billa, intituled, "An Act for naturalizing Ernest Barnerd." 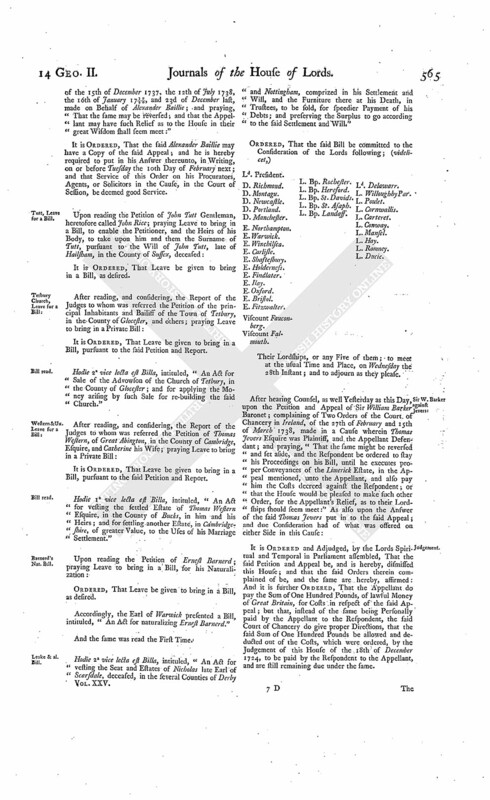 Motion for an Address, to know who advised the King's Answer to a former Address. Moved, "To order, That an humble Address be presented to His Majesty, that He will be graciously pleased to acquaint this House, who advised Him to return the Answer given to the most dutiful Address for inserting the Issue of their Royal Highnesses the Prince and Princess of Wales, in the Prayers for the Royal Family, in the Book of Common Prayer." Dominus Cancellarius declaravit præsens Parliamentum continuandum esse usque ad & in diem Lunæ, decimum nonum diem instantis Januarii, hora undecima Auroræ, Dominis sic decernentibus. Standing Order, about Committee Journal, to be considered. The House being moved, "That the Entry in the Journal, at the Beginning of this Parliament, of the Names of the Receivers and Triers of Petitions, in French, might be read:"
The same was read accordingly. As was also, the Standing Order of this House, of the 23d of May 1678, empowering the Sub-committee for Privileges and Perusal of the Journal Book, to meet, and examine the same, even after the Session. Ordered, That the said Standing Order be taken into Consideration on Thursday next; and the Lords to be summoned. Gallery in the House to be pulled down. Ordered, That the Gentleman Usher of the Black Rod do cause the Door of the Gallery in this House to be locked up, and the Key delivered to the Lord Great Chamberlain; and that the said Lord Great Chamberlain be desired to issue his Warrant to the Officers of His Majesty's Board of Works to take down the said Gallery, after the Conclusion of this Session of Parliament. Estimates of the Charge of Forces delivered. "Estimate of the Charge of the Guards, Garrisons, and other His Majesty's Land Forces, in Great Britain, including the Land Forces and Marines in Lord Cathcart's Expedition, for the Year 1741." "Estimate of the Charge of Seven Regiments of Foot, amounting to 5705 Men, to be raised for the Service of the Year 1741." "Estimate of the Charge of Four Regiments of Marines, amounting to 4620 Men, to be raised for the Service of the Year 1741." "Estimate of the Charge of His Majesty's Forces in the Plantations, Minorca, and Gibraltar, for the Year 1741." Standing Orders to be read. Ordered, That the Roll of Standing Orders of this House be read To-morrow; and the Lords to be summoned. Dominus Cancellarius declaravit præsens Parliamentum continuandum esse usque ad & in diem Martis, vicesimum diem instantis Januarii, hora undecima Auroræ, Dominis sic decernentibus. 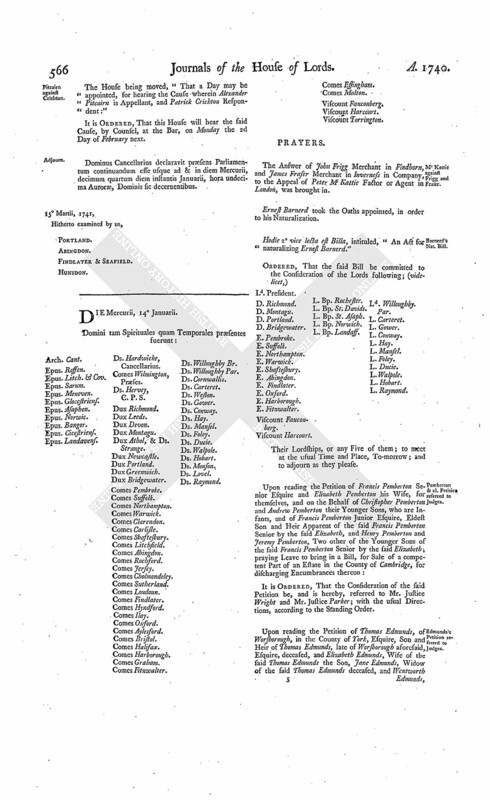 With a Bill, intituled, "An Act for dividing and enclosing several Open Pastures and Commons, in the Townships of Great Driffield and Little Driffield, in the County of York; and for settling certain Yearly Payments to the Prebendary of Driffield for the Time being, in Lieu of his Tithes, pursuant to an Agreement and an Award made for those Purposes;" to which they desire the Concurrence of this House. The House being moved, "That Colonel James Stewart may be permitted to enter into a Recognizance for Mary Logan and her Husband, on account of their Appeal depending in this House; they being in Scotland:"
It is Ordered, That the said Colonel James Stewart may enter into a Recognizance for the Appellants, as desired. The like Motion and Order for James Baird Esquire to enter into a Recognizance for Archibald Denham Esquire; for the same Reason. Brinckman's Nat. Bill: Committee revived. Ordered, That the Committee to whom the Bill, intituled, "An Act for naturalizing John Richard Brinckman Esquire," be revived; and meet To-morrow. 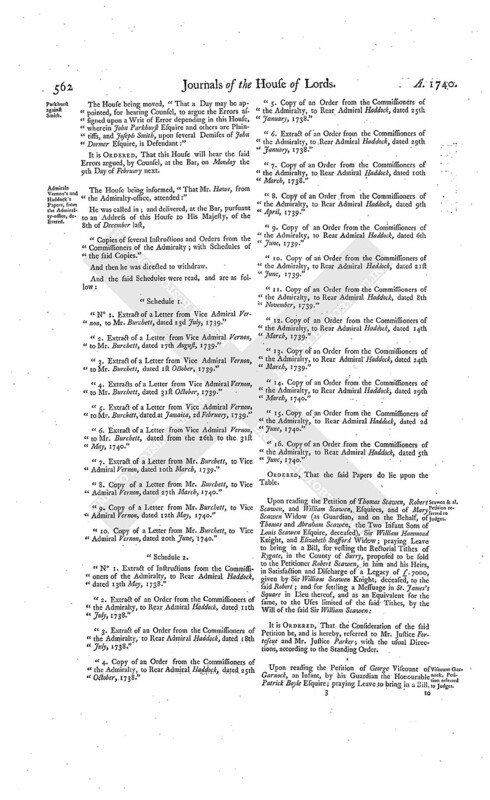 The Roll of Standing Orders of this House was (according to Order) read. Address for Extracts of Treaties. Ordered, That an humble Address be presented to His Majesty, "That He will be graciously pleased to give Directions to the proper Officer, to lay before this House, Extracts of all the Treaties concluded between the Crown of Great Britain and any other of the Powers of Europe, from the Time of His late Majesty King George the First's happy Accession to the Throne, to the Year 1740, which have already been communicated to either House of Parliament, so far only as any of the said Treaties relate to mutual Guaranties and Subsidies of any Kind whatsoever." Dominus Cancellarius declaravit præsens Parliamentum continuandum esse usque ad et in diem Mercurii, vicesimum primum diem instantis Januarii, hora undecima Auroræ, Dominis sic decernentibus.